UDHR 70th Anniversary – Event Planning Toolkit – Check out this toolkit by UNA-USA for ideas on how you can plan and host an event that engages and educates Americans about Human Rights. Standup4HumanRights – Check out the official UN website on the 70th Anniversary of the UDHR to see how you can promote and defend human rights. The Advocates for Human Rights – Strengthens accountability mechanisms, raises awareness and fosters tolerance. Includes outstanding educational resources and opportunities to get involved. Amnesty International USA – A global movement of people fighting injustice and promoting human rights including opportunities for youth action. Check out their new Write for Rights campaign which includes Educators Guide. The United Nations Associations of the United States – A membership organization dedicated to inform, inspire, and mobilize the American people to support the ideals and vital work of the United Nations. Local chapters across the USA and many programs. Participate in the Picture Human Rights Poster Contest for youth from ages 5-21. Organize a public reading of the Declaration in your community – in your school, organization, etc. Organize an exhibition on human rights or host the UN Human Rights UDHR70 exhibition in prominent public places. The UDHR wherever: Seek out places in every city and town where the articles of the UDHR can be written or displayed, e.g., transportation centers, shopping areas, sports centers, libraries. Paint murals, Hang posters on subway walls or public walkways, post individual articles on fence posts, sidewalks, or staircase risers. “A UDHR in every pocket”: During the anniversary year, make one-page copies of the UDHR available in public places (e.g., post offices, libraries, polling places, schools). Reproduce the Declaration using various formats (bookmarks, brochures, etc.). Send out a copy with every organizational mailing, hard copy or electronic. Give a copy to everyone receiving a diploma. A UDHR 70th Anniversary calendar: Select two or three UDHR articles on which to focus each month or week during the anniversary year. Coordinate these with local, national, and international holidays (e.g., Article 15 during the month of a national independence day; Article 18 during a religious holiday period; Article 23 in May).Benefit from existing events (e.g., Women’s Day, Labor Day, Indigenous Peoples Day) to draw attention to human rights issues and the UDHR. A UDHR remembrance moment: Plan a specific date and time, perhaps noon on 10 December 2018, when everyone in the community will honor the UDHR. Let citizens unite in a common symbolic action (e.g., lighting candles, a moment of silence, the ringing of bells or sirens, raising the flag, half-an-hour human rights programs at schools, concerts for children). UDHR “mobile textbooks”: Paint or decorate public vehicles (e.g., buses, trains, streetcars, utility vehicles) with UDHR celebration information; a fleet of vehicles or series of train cars could each bear a different article of the UDHR. Offer an award for original design (e.g., the best decorated UDHR taxi). UDHR “read-ins”: Organize public readings of the UDHR (e.g., schools, state legislatures, city councils, churches, markets, civic meetings).Read it in all the community languages, including sign language. Invite diverse members of the community to be readers. Take the human right temperature of your school: Analyze the results and take action to improve. Learn more with this Human Rights Friendly Schools Toolkit. 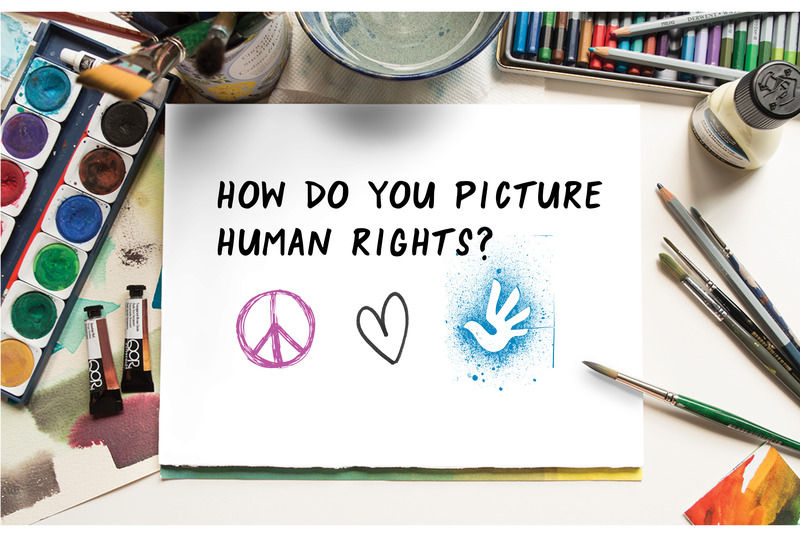 Have your classroom or school participate in the Picture Human Rights Poster Contest for youth from ages 5-21. Organize a UDHR “flash mob” at a school assembly or community gathering place (e.g., shopping center, train station, cafeteria, farmers market, sports event). Read it, sing it, perform it, distribute it. Train students to teach the contents of the UDHR to other young people in schools, youth organizations, on the streets, and to the population in general. Develop oral history projects. Have young people interview community elders, especially those born before 1948, about their experience of human rights (e.g., how are their lives different because of the UDHR?). Publish, broadcast, or develop these into dramatic presentations. Sponsor art, video, and writing competitions on the UDHR with the winners’ work being published, printed on calendars, added to an on-line gallery, or otherwise widely distributed. Organize street theatre, dance, and other popular presentations relating to the UDHR and human rights created and presented by youth for a variety of audiences. Organize workshops, seminars, lectures, debates, exhibits, and symposia on human rights inside and outside the institution. Translate the UDHR into every language spoken in the community and publish copies of these translations. Local Human Rights Day: Get the city council to declare December 10 a public holiday (and each year from 2018 onwards). Engage libraries to distribute UDHR bookmarks and display UDHR posters and human rights reading lists for adults, youth, and children. Encourage religious communities to promote human rights education and plan activities around the UDHR, including distributing the UDHR and reading the UDHR aloud at December services. Encourage civic organizations to sponsor or underwrite UDHR 70th Anniversary celebrations and human rights education activities, including distributing and reading the UDHR aloud at their meetings. Encourage school districts to offer teacher workshops on human rights. Establish a regular human rights space in printed and electronic publications and radio programming for UDHR 70th Anniversary information and commentary (e.g., an on-going section for essays, editorials, comments from people of all ages, stories about national and international human rights). Publish a series of essays and editorials that present local issues through the lens of UNHR articles. Run public service announcements about the UDHR. Publish the UDHR in all local media on 10 December 2018 and 2019, including school and college newspapers, local radio stations, church bulletins, organizational newsletters. Host a UDHR call-in show: Focus on a specific article of the UDHR every week. Discuss it and Invite members of the community to add their comments and questions. Sponsor lecture series, concerts, exhibits and other cultural events relating to the UDHR and human rights education. Use local festivals and celebrations (multicultural, arts and music, etc.) to promote the Declaration through the arts. Commission UDHR-related artworks (a musical composition, a play, a film, a video, a dance, a graphic novel, a mural).